Fantastic list. I'm looking seriously at the CRM and online collaboration offerings you've listed. Basecamp is worth using for PM. John, great list! Thanks for the Dimdim mention. We think your audience will benefit from using this free service. It allows instant co-browsing on any document. Lets try and differentiate between "Open Source" and "Free". SugarCRM is Open Source. Open CRM is Free. Similar cost, vastly different philosophy. Mysql? Are you joking? Not when there's postgres around. SMF, the Simple Machines Forum, is a much better alternative to VBulletin. For one thing, SMF is *truly* free, no fees and no yearly costs. It also has a vast number of add-ons and special interest modifications, many of which are unavailable in any form for VBulletin. PostgreSQL is a much better free / open source database if you are looking to get a feature set closer to that of Oracle --- in particular, Oracle's locking model (MySQL's locking model is much more like that of Microsoft's SQL Server). Under the IT Service Management/Help Desk Systems section, you've incorrectly spelled Jira as "Jirra". Also this product is not free. Bugzilla is one free alternative. Not sure how you choice of Mysql being the best and most cost effective DB server was made, but I think that you should have evaluated Postgresql/EnterpriseDB before making that assessment. Enterprises looking to transition from commercial DB systems would make their assessment based on ease of migration, stability, scalability and adherence to SQL standards, things that Postgresql does well. Aptana over Dreamweaver. It's free and I've seen no less than 10 DW users convert over once they realized how nice Aptana really is. Jira is actually not free for commercial companies. So I wouldn't consider as an alternative, unless we are just talking about non-for-profit organizations. While I really support free software movement, I don't really think Open Office is a real alternative for bussiness just yet. Good list, and i checked out Showdocument and i like it, nice and simple, and someone has finally developed somethign i suggested about 8 years ago.. Nothing *wrong* with MySQL, but for something a bit more enterprise oriented, PostgreSQL should be considered. It's stronger in that space than MySQL (whose space seems to be the more light web app arena). Unfortunately I don't have a list of alternate PBX providers with me right now, but there are several others out there (that I found after being somewhat underwhelmed with Digium/Asterisk). Found a typing mistake: in the vBulletin section you've written "your up and running." That should be "you're up and running." Basecamp is great, but it isn't open source so I'm not sure why it's on this list. How about replacing Exchange server? What about Email applications that replace Exchange? I know of Zarafa (zarafa.com). Curious if there's any others? For Database Software you might also mention PostgreSQL (http://www.postgresql.org/) which is an impressive piece of free software. In 'Database Software' didn't you forgot Postgresql ? Duoh, you forgot Business Intelligence! Pentaho and Jaspersoft are two choices for example. We use it in our company and it is not open source nor lower cost then other ticket software. Very expensive support with little gratification. Many "know bugs" with no time line to be fixed as stated in most of the issues taken from the knowledgebase they offer. In the server software section, there are tons of alternatives to Windows other than Linux - there's FreeBSD and the variants and Open Solaris, just to mention two. You also forgot the other leading database software, Postgres, which is completely free. Lots of other choices out there, too. PostgreSQL is missing in the category Database Software. It's better than MySQL and is able to compete with oracle database solutions! Hi, what about ERP packages? nagios is a good alternative to monitoring your network. free, open, and very extensible. I would take MySQL off the list, and put PostgreSQL in it's place. PostgreSQL is far more suited to the enterprise. Great list! I'm evaluating several LIMS systems for my company such as Bika Labs, and Plone for internal process management. Another great success we've had is deploying Moodle for management of internal training courses. which has other listings of open source programs, many of which are "enterprise ready". No matter how much people are forcing Open Office and say is a perfect replacement, reality is Open Office is CRAP and far away to compete with MS Office. No PostgreSQL? No Firebird? Both of these RDBMSes are technically superior to MySQL. MySQL is is good, but anyone considering MySQL should also look at PostgreSQL which is every bit as capable. Thanks for compiling that list, however I'm particularly interested in hearing about open source financial systems that would be suitable for running a small services company. Do you have any recommendations or experience with such software? You should take a look at www.openemm.org for email marketing. It's the only system I've found that triggers follow up emails based on what was clicked on in previous emails. Great post! May I suggest looking into MindTouch Deki (www.mindtouch.com) - *the best* open-source enterprise collaboration and business automation platform available. With hundreds of thousands of users within the community and powering the Mozilla developer community, MindTouch Deki has the community and infrastructure behind it to convince your readers that open-source applications are worth looking into. Hi John, Rebecca from Yugma here. Thanks for listing Yugma in your top 25 list! For those interested we just released a full Linux desktop sharing version (in beta) and a plug-in for Outlook. If anyone has any questions about Yugma, please contact us at info@yugma.com. You should replace MySQL with PostgreSQL. Add to the list FreeBSD, NetBSD, OpenBSD, Solaris. There is more to software which you currently lack in knowledge, I recommend you start hitting the books. Jira has one "r" rather than two. The link is correct, just not the actual text. The list is great. I would like to add Plone under CMS. You can't beat it. How could you possibly leave out Joomla!?? 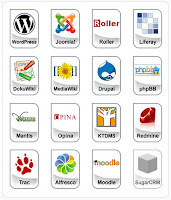 It is arguably the global leader in Open Source CMS applications. Appreciate the article. Though I consider myself well-versed in Free software, I was unaware of a couple of those services and options. * MySQL - Most widely known, better for heavy-read apps, like webapps. * + Postgres - More ACID compliant than even MySQL + InnoDB. Better/faster for multiple users (from a DB perspective, most webapps are actually single-user). Better/faster for complex queries. John, Thanks for the mention of Zenoss. Nice list. I found a great site, www.osalt.com, while searching for free alternatives to the overpriced crapola we use in the office. Shows open source alternatives to pretty much every well known pay-for program out there. Thanks, very interesting article. Unfortunately there's a slight typo: it's Jira and not Jirra. Not quite easy to implement, but very effective once you're installed and configured properly. I am in the process of updating my comments on Freeware but there is little overlap from your list and mine. It is a great field. Again, nice article. JIRA is not open source project. In many ways it looks like an open source project, but it belongs to the Atlassian Company. I use it and it is a great product. Just a clarification - there are several entries above that are neither open source, nor free (e.g. BaseCamp). It's a wonderful (and cheaper) alternative, but is certainly not open source or free. vBulletin is not open source. You should have listed phpBB. That one IS open source. Linux makes a great client OS as well as Freebsd (PCBSD) flavor. Otherwise a great list. Next time don't leave out IM packages like Google Talk, AIM, Yahoo, MSN and Paltalk. How does MySQL make your database replacement list, but not PostgreSQL? Especially in the light of the recent 5.1 fiasco, and the ever-more-obvious reasons for Sun's loss of MySQL developers. PostgreSQL offers a very rich feature set, high availability, clustering, superior performance (most notable for a database which has a write load in addition to the read load (read: not just for web applications), allows procedural scripting in just about any language, goes cross-platform... The list just goes on and on. But the real winner is that the PostgreSQL devs don't do a release when the product isn't ready, since they aren't motivated by deadlines for monetary gain. The product is released when it's ready, and that's something that people should look for in a server product. Shame on you for missing one of the big players! For people who like support and paying for a product, there's also Bizgres, the commercial variant of PostgreSQL -- differing notably from MySQL in that it's run by another company, not the one handling PostgreSQL main development. Speaking as someone that's spent a lot of time with MySQL and Postgres, that works for a consultancy with dozens of other programmers and admins with similar experience, you really should reconsider calling MySQL the "best" choice. PostgreSQL is worth mentioning as well as MySQL. It is interesting that you don't mention PHP as an open-source application, nor Apache or Google Front End (which is what this site is hosted on, actually). How come JIRA (bug tracking) is open source software? Even a basic look at the web site will give you a hint that it not open source. If it is for Enterprise applications, there is not even a single mention of any SOA products like FUSE (www.fusesource.com), OpenESB, BPMS software from Intallio or JBoss, what about any webservices framework like Axis2 or CXF. What about Eclipse and BIRT? Why are they not available here? Oh! Is the list really for Enterprise application it looks funny with inclusion of lot of funny stuff and avoid 'real' enterprise products. Its amazing to see how people are commenting that this is an wonderful list. The list is simply CRAP except for one or two products! John, In my experience Hyperic beats the pants off Zenoss. I hate to be a wet blanket, but not all of these appear to be open source...as in you get source code and all the associated rights. There are some pretty specific requirements around the use of the OSS trademark that call for this. A lot of these are just free, or even pay for programs built in top of open source code. This is a great list! Thank you for taking the time to compile it. I knew about most of these apps, but several are new to me. Thanks again! Sorry, but MySQL is in no way superior to PostgreSQL. Our own Nuxeo ECM platform is a popular, open source and enterprise-class alternative so document management behemoths such as Documentum, FileNet, OpenText. Social Networkng Platform Elgg ( http://elgg.org ) is also highly customizable to your needs. e-Learning Platform Moodle ( http://www.moodle.org ) is awesome for distance education and collaboration. Too bad this is yet another bit of farkbait and not researched at all. Where's postgresql? firebird (no, not firefox, firebird.)? freeswitch? As for network monitoring stuff... there's quite an awful lot of those things around, plenty good and nice. If ``enterprise-y'' is yet another excuse for packaging magic bullets against warm seat incompetence, then this blog post is lots enterprise-y in itself. Then again, it's about as good as a typical gartner soundbite but a lot less costly. Nice post, but why is mySQL the only mention for open source databases? mySQL is a joke of a database and one of the buggiest products ever produced. A far better choice for open source is Postgres. I would add trixbox (based on asterisk) to the list as one of, if not the best digital voice solution that is open source and free. I am looking for a Visual Studio replacement any sujetions? I wonder why you think MySQL is best and most cost effective. Why not mention PostgreSQL for those folks who are more used to traditional full-featured databases requiring ACID , extensibility, security, etc. ? Good list - but why didn't you mention phpbb rather than vbulletin which isn't really opensource? Education is the ONE Problem slowing FOSS adoption. People just do not realize Open Source surpassed proprietary in many product spaces over the last decade. Clearly Linux for Server, Apache for html webserver, MySQL, Postgesql, etc. Java! Eclipse! But starting to drill down into those that are now out-featuring their proprietary competitors is what is needed. OpenOffice.org for example. Firefox for another. 2008 is the Year of Open Source as it marks the year the bulk of business software can be open source and will offer superior features. Gimp, OpenOffice.org Draw, Skencil, ps2pdf, etc. Sure, some proprietary SW vendors are still innovating and deserve to rule but in established, unchanging product spaces there is NO reason to BUY proprietary. Any government entity BUYing Exchange or Windows Server should be sued IMO. Totally burning taxpayer money on an inferior product. I did a deep survey in '06 and released it as a book - totally authored and published with Open Source ONLY. Feel free to update it with this list...and to search sourceforge for more products. http://sourceforge.net/projects/bizguide/ - its got a couple hundred apps reviewed. OpenNMS (http://opennms.org) is IMO a better netwrok management suite more suited to enterprise networks. Seconding the Postgres vs MySQL thing. In regards to the above comment about Hyperic vs Zenoss: Hyperic has a great UI, but dear god is the agent ever a piece of junk. It leaks memory like crazy and randomly stops performing in an acceptable manner, leading to me getting paged in the middle of the night sometimes. A lightweight agent in a non-Java language would be awesome. I still use it, but I'm looking into alternatives. Zabbix, Zenoss, and JFFNMS look like they might be interesting alternatives to Hyperic. Hi John and others - Great list and subsequent suggestions additions and modifications. Many of our Customers have been willing to adopt Open Source applications in support of their business. Some are heading beyond the list we have here and a further favorite seems to be ADempiere to support ERP, MRP .... Orders... Accounting function. This app operates on Postgres which might add further to the MySQL Postgres remarks. Wow, what a horrible list. Did you even go to the websites of some of these products (e.g. JIRA)? Several of these products are neither free nor open source. I can't believe somebody put this on Slashdot. As to the recommendations for Zimbra as an Exchange replacement, if you actually want to replace Exchange so that it still talks to Outlook you have to get the licensed (which costs less than exchange, but it's not nearly free). If you have business or Sales guys, believe me, they're not giving up their Outlook without a fight. Plus, since Yahoo absorbed them, there's real question about the ongoing product. There is no such thing as "ITIL Certified". I know OTRS and I believe their claim was actually "ITIL Compliant" which is a different kettle of fish. At an ITIL Asset Management course recently we were warned by the instructor to be wary of companies claiming they are ITIL "Certified" - because they can't be. I didnt know that JIRA is open source. I love TrackIT, cheap, easy to use and has all the essential needs on my org covered! From when Google analytics became Open Source. The author is purposefully blurring the line between Open Source and various freeware and low cost commercial software out there. JIRA really should not be on this list -- either as great software or open software. Look elsewhere for good defect tracking code. Bugzilla, perhaps. What is vBulletin doing on an Open Source list? Seriously. None of your project management "alternatives" is free software. Actually they are all Software as service model. Only activeCollab offers you source-code, and even then, I doubt it will be opensource as they charge 399 plus 199/year maintanence. This is no doubt a bought article. I, for one, appreciate your post and the information provided. What some of these idiots don't seem to understand is that the spirit of the article is to provide an alternative to commercial products. Yes, sure, You mentioned some commercial products as open source or free. So, what? It's an honest mistake. You can always go back and edit the post and make the correction. Besides, if you know anything about any of these open source products, then you know the difference. If you don't know open source, then you will soon find out quick whether something is free/open source, or not. Either way, the reader gets exposed to the alternatives. That is a good thing. Personally, I don't give a rat's a$$ about Postgres. I have never used it and don't intend to unless Sun makes my MySQL life unbearable. If, after reading this post, you do any research on open source RDMS, then you are surely to see other alternatives to MySQL that include Postgres. MySql is really popular to a LARGE MAJORITY of us (at least in my circle) because of LAMP/WAMP/XAMP (The "M" being MySQL). The same goes with CMS systems where there are several. Personally, I prefer Joomla!, but I would like to take a look at Drupal someday. I have never heard of Alfresco, but I will give it a look too. I guess all I'm saying is have an appreciation for John's effort and go kindly on the criticism. You OCD folks need to dial it down just a bit. I'm looking for a good Exchange alternative, preferably running on *nix. I've heard of Open-Xchange and Zimbra and a few others. I've heard of problems with most of them. I was seriously looking at PostPath until Cisco bought them and removed the option to run your own server. BaseCamp is not open source. Rails is open source and Rails is used to build BaseCamp. But Basecamp, like all hte other 37 signals products is closed source and pay by the month, not pay once and use forever (as with other closed source apps). Those of you that want an email server you might want to look at scalix. It is not completely free, if want all the wireless features there is some cost. I used the free version and found it very easy to use and ported easily to Outlook. Dimdim integrates with free Zimbra zimlet - start free meeting right from your in basket or address book. I'd like to recommend cyn.in - our open source offering for collaboration within the enterprise. It combines the capabilities of wikis, blogs, file repositories, image galleries, microblogging and other social apps in a secure environment. The community edition is available along with the source code. There are paid SaaS options starting at $99/month and an on-premise model to host cyn.in behind your firewall. Don't you wish people would at least read a couple of the comments before posting the same thing over and over and over? Makes the feedback on this article worse than useless. Yes Postgres is a good enterprise level open source database. We know, thanks. Apart from the fact it's fscking obvious... the first post should have been sufficient, for crying out loud. This is a great resource for open source programs, thanks. I am wondering why you have not included one of the biggest open source project success stories over the last 5 years with the explosion in use of the Moodle Learning Management System that has now over five times more installations worldwide than all of the other LMS's combined including the proprietary giants like Blackboard and WebCT. The Moodle success story is due to the unique Moodle commercial partner system whereby all of the 40 (as of now) Moodle partners who offer authorized Moodle support services like hosting and training pay a royalty to Moodle.org that keeps the free and open source Moodle growing and improving. Remote-Learner.net is the largest and most experienced of these authorized Moodle Partners, with several core Moodle progammers on staff, serving the territory of North America with top quality professional support to academic and corporate clients. We would be happy to help you and your constituents to get the most from Moodle with our very reasonably priced hosting, support, training, instructional design, development, and strategic planning services. Although this is primarily geared towards education and university models, Moodle offers a fantastic open-source PHP-based learning management system and course management system. Alfresco starts at $24,000 a year on a subscription model. Doesn't seem that cheap to me. The community edition is a completely unsupported alpha testing ground. Are there any more practical document management alternatives out there? Email/Exchange: Zimbra (www.zimbra.com - a Yahoo company) awesome email server with phenomenal AJAX based web mail - shared calendars, contacts lists, to do lists, web based jabber instant messaging, etc. All of the above have been implemented in federal government organizations. A great healthcare IT open source alternative is OpenVista, at www.medsphere.com. Decent list but there are obvious omissions and such as others have already mentioned several times and what I really wish you didn't do was include non-free/ open-source products in your list (Jira, vBullitin, etc), especially when there are even better free options (phpBB, RT, Nagios, etc). If this is a list of open source projects. It shouldn't have items that aren't fully open source in it. It might seem like I'm being picky to some but it's a valid point, notwithstanding. For virtualization I have had good experience with Virtual Box. Another great alternative for project management is Intervals, a web-based tool that also includes time tracking and task management. "Alfresco starts at $24,000 a year on a subscription model. Doesn't seem that cheap to me. The community edition is a completely unsupported alpha testing ground. Are there any more practical document management alternatives out there?" Alfresco Labs is Unsupported, but it is a very solid piece of software to manage files. I can https upload a 2GB file with no problems, try that with Idontcarepoint or with any other document mgmt software, it'll crash and whine. webdav, https, cifs, ftp, sharepoint protocol, multitenancy, etc, etc. It has a lot of features. First of all, thank you for listing http://opencrm.co.uk on your site, it is very kind of you and we really do appreciate your support. However, I really don't get some of the people who are commenting on your articles, what planet are they on? I can say, 100%, that we have not previously communicated with John and therefore, there is no financial reason for us to get a mention, so to suggest (granted with reference to another product in Johns list), that articles contain links that have been 'bought' is both ridiculous and insulting. As a previous poster put so delicately 'dial it down a little'. Anyway, good luck with your social networking and industry commenting, have a great 2009. Thanks for the list (and all the useful comments! ), I'll check some of the suggested products. Have a look at SQL-Ledger. Is an ERP-Solution. Our company has a help desk software tool called HelpSpot that you may also want to check out. Much more affordable than the enterprise stuff. We also sponsor the open source help desk list which you mention in your article. If you're looking into ITIL, you might check out FootPrints. Its Perl based and a good bit cheaper than the Enterprise level systems. dimdim, heh, worthless. After multiple attempts with customers to use this product, I gave up and emailed support. They never returned the email. Armed with an upset customer and my disgust in my hip pocket I called support to no avail. I vowed at that point to turn all I could away from this horrible solution. Still no call back from support btw. hrmph! great list, where is Wordpress and Joomla ? Dimdim sure looks promising while there's a bunch there that established it's rep already. Looking forward to more open source apps! Hopefully, on open source platforms, too! We have lots of scriptlogic products in our environment that really simplify many things. Their active administrator provides a good way for advanced active directory management. As for desktop management their desktop authority works well to eliminate group policies and handwritten logon scripts. I would add TrackRay to the list - it is free web based task tracking and project management solution. Our health agency has been using it for more than a year now. Great list, with tight budgets cloud copmuting is offering a lower cost alternative to many enterprise solutions. For audio and web conferencing, you could even consider RHUB's 4-in-1 appliance that provides secure web conferencing, remote support, remote access and webinar. They even offer free audio conferencing. You might want to check out some solutions which integrate tools which cater to more than one category. For example the HyperOffice Collaboration Software integrates project management, web conferencing and web databases. You might want to use Intranet Software that offers advanced business solutions. I think the biggest issues with using alternative software is the ability to have everyone else jump on board in a company to have it compatible. Now Proofhub is on the peek but I couldn't see yet. I personally guarantee you try this and I know you would love this software. Your website is very helpful. I can't miss having it on my bookmark. MySQL doesn't scale well for enterprise class applications. PostgreSQL does. You missed the boat on this one. I agree that when the budget gets tight, there are many great free alternatives to paid apps out there. But one that I would not want to skimp on is Proxy Networks' Remote Desktop software. It is highly secure, whereas a lot of the freeware RDS is not so secure (it is freeware). Great share thank sfo rthe awesome read!!! I really use Open office. A very good software. How about Blogger.com Is good to my enteprise? Designed for small and mid sized companies it really resonates when demonstrated to business managers. I have one website to you to have a look at called Workforcetrack.com There you may find lots of business tool such as CRM, Project Management, Accounting and Finance, HRMS and many others also it has android and iPhone apps. The best is the supporting team which is just brilliant.